Well Aren just graduated up from the typical drone you’d find in any kids home, to something more substantial (read: FASTER–isn’t that what everything is about: Speed?). The key differentiator here is the having what they call “brushless motors”. I don’t know a lot of about these puppies except that there seem about 5X stronger and faster. This means tighter turns and more fun over all. Traditional electrical motors do have brushes and presumably that would cause a lot of friction in there. Through the wonders of modern techno-magic, we now have electric motors which do away with this whole brush business and hey, it works! 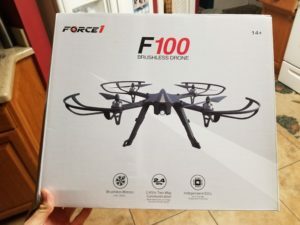 If you’re looking for that next step in droning but aren’t quite ready for racing drone speed (coming up in a post in the next couple days), then I highly recommend this drone. We opted for the F100. You can get it on Amazon for about $150 which is pretty darn good for a drone with this kind of speed and power. IMPORTANT NOTE: I took a moment to make some initial agreements with Aren about safety before we purchased this. You are moving our child up into a whole new level of power. Those blades won’t be stopped by a finger, if you know what I mean. Could result in serious injury if not handled properly. In the video you can see it flying at the park (may as well cut to the chase and show it to you in action). If you purchase this drone, there are a couple of things to know. First, don’t let your child (or yourself) stick the wrong batter terminal into the charger. Only one has the right plug for it, but you can apparently force the other one (the one you plug into the drone’s power socket) into the charger and you’ll ruin your battery/charger if you do that (my son was very eager to get going and didn’t take his time to read the manual before plugging it in while I was at work). The next thing to know is that the red button on the radio remote is for unlocking the drone (and locking it). The manual has do you press it to start the rotors (this is a nice safety feature). It’s a short press to unlock. By short is meant “about 1-2 secs”. If you hold it any longer the drone will just lock (again). This had us frustrated for a while until we realized what we were doing wrong. Aren absolutely LOVES this drone. It’s a stable flyer and he literally took to it like a newborn duck to water. Of course, the next day we went to a local drone race for the first time and now he wants to start learning how to do that. But that’s going to be the subject of another post (coming soon!). Getting better by the minute !